Most paintings, obviously, are composed of at least one layer of paint. Underpainting, glazing, scumbling, and impasto are employed in traditional painting in order to fashion an integrated, finished work. However technically important, layering in a traditional Western painting is incidental to the final product: a traditional academic painting hides its layered tracks, so to speak. Nineteenth-century academic painting -- an Ingres portrait for example -- hides its technique from the casual viewer quite well -- we would never think of an Ingres in terms of just paint layers, as if the works processes were analogous to, say industrial manufacture. In industry, commodities are made by carefully organizing the steps of the fabrication process. In physics, white light can be parsed by means of a prism into primary colours, the way a brick wall is analyzable into individual bricks. White light, as Newton demonstrated (to the later chagrin of Romantic poets like Blake, Keats and Wordsworth) is made of a spectrum of colour. 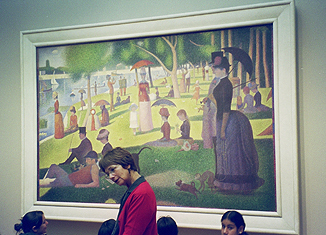 In the nineteenth century Georges Seurat made paintings in which primaries were not obscured by blending, but placed side-by-side in an attempt (more suggested than observable) to make a few colours suggest many. In modern commercial "process" printing and in colour photography, colours are combined or layered by various means to produce many hues (Red Green and Blue, for example, are used to produce the colours printed out from desktop printers). Both the physics of colour and industrial processes are related to what we are calling "layer painting" in this exhibition, because a certain attitude to science (better called "scientism" in relation to art practice) and labour coincided in the 1960s/70s origins of this high art practice. Process painting emphasizes the processes of paint layering, almost as if the essence of painting were its layers, and almost as if such painting were a "deconstruction" (meaning in this context a political, de-mystifying analysis) of art. In the case of 1970s painting by Garry Neill Kennedy and Jeff Spalding, process painting led to an abstract image that is the mere residue (however beautiful) of what the painter has done through the process of painting. Layer painting was a species of "process" art that began in the 1960s, developed through the 1970s as abstract and often monochromatic works, and became complex in the 1980s and 1990s when, in some cases, iconic content crowded out and de-emphasized the painting process in favor of charged imagery. The story of layer painting begins in Canada with art produced within the 1970s circle of artists at the Nova Scotia College of Art & Design. Layer paintings dissolution (with important exceptions in Eric Cameron, some of Gerald Fergusons work and in artists such as Angela Inglis) happened throughout the 1980s and 1990s when the use of iconic imagery once again subsumed the process of layering paint within the technical requirements of producing a recognizable image. Once again, as in an Ingres, the painting process is buried under an image. A 1970s layer painter like Jeff Spalding (cited by many as the first of the NSCAD associates to do this kind of work) treated layers of paint as units the way a post-impressionist painter like Seurat used tiny, discreet pure-coloured marks to make a work; layers are added or subtracted as if counting out an industrial procedure (in fact, Eric Cameron, and Gerald Ferguson continue to literally count paint layers by various means), or as if to make visible the amount of time taken up in the work's making. Layer painting showed counting and time, and it was performative in the sense that it showed evidence of time passing as the painting process proceeded. Layer painting can make the artist's personal touch disappear - some layer painters, Gerald Ferguson for example, have employed assistants to make their work (in earlier "maintenance paintings" he instructed an "end user" to "maintain" the painting in a colour of their choice). The artist's 'patte' may easily be lost in layer painting, but it can just as easily be restored or emphasized, often ironically, as in the work of Monica Tap, who in recent works layers painted drawings of Baroque landscapes over each other until the source images get illegibly dense. Layer painting is inconceivable without the ideology of gesture in Abstract Expressionism and the analytical strategies of Process Art. Like the hunt for sources that used to take place in literary studies, or the search for the motif in art history...,the narrative of process establishes a primary meaning, an ultimate, originating referent that cuts off the interpretive chain. That is, an aesthetic of causality is reintroduced, a positivist monologue that we thought modern art was supposed to have gotten rid of:A (paintbrush) + B (paint) + C (support) + D (the manner in which these are combined) give E (painting). There would be nothing left over in this equation. Given E, ABCD could be deciphered, absolutely. By making the artist a kind of engineer who solves a problem of many parameters in his work..., the discussion of process in art is refitted to this heuristic mold. The object of this critical discourse then would seem to be: given the solution (the painter's "eureka"), find the problem. Process art emphasizes working methods, but in more recent work of this tradition, for example Aimee Mowers use of molten candy in wall works, Monica Tap's Baroque layering, John Armstrongs crusty impasto paintings that hang off the edges of a canvas, not to mention Gerald Ferguson and Eric Cameron's emotionally fraught layering and Angela Inglis' archeological sections, loaded imagery muddies process painting's focus. 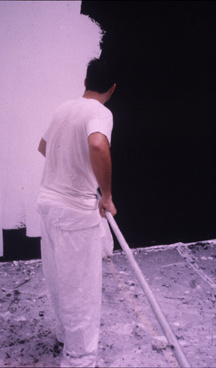 In the 1980s the iconic extremes of layer painting, that is, layered or transparent " palimpsest" painting, produced dissonant effects (for example in David Salle and Sigmar Polke and in some of Fergusons work) that in the context of this exhibition can be read as a rejection of layer painting's minimalist and process origins. Layer painters were never able to depend on the reception of layer painting as a mere artifact of a process, but they were well aware of the contradiction involved in denying the metaphysical implications of high art within the context of high art. Abstract art may still be publicly regarded as an ink blot or Rorschach test upon which a viewer either 1) imagines or projects representational forms or 2) decides exactly how or with what flavour of 'meaninglessness' the work embodies. For an art-savvy public, however, layer painting often encounters a stranger reception: an abstract painting looks like the reanimation of an historical style before something like Gombrichs 'ambiguous traces.' A stenciled fish in a Gerald Ferguson painting; the tracery of a Monica Tap work; the ghostly, snow-like presence of an Eric Cameron "Thick Painting", the visibly built up layers that peek out of an early Jeff Spalding, Garry Neil Kennedy or Bruce Campbell work are accounted for by the contemporary cosmopolitan viewer within the history of contemporary art first and not to Gombrich's 'an absence of meaning.' Indeed, the "abstract" versus "representational" dichotomy has disappeared within art circles: viewing is now hierarchical and classificatory. Ambiguities of viewing are valued because a work is not regarded as a puzzle or a code. Viewers might still look at a Pollock painting as if it were an aerial view of Siberia (as Pollocks local grocer did) or perhaps they might persist in seeing an Eric Cameron "thick painting as clustered snow, but if so, they overlook layer painting as a kind of performance of labour. Much contemporary layer painting highlights the functionless labour of its production. Frank Stella, a key figure in the rise of process painting, insisted that his early stripe paintings (c.1959) were nothing more than painted stripes. "What you see is what you see"  metaphysics is to be avoided. Stella merely filled in a penciled area that echoed the framing edge of a painting. Performativity is layer paintings debt to Pollock. Stella supplements the performance with a distinctly American matter-of-fact explanation. Sometimes this emphasis on painting as mere labour, as in paintings by Garry Neill Kennedy and Eric Cameron, resembles a sweat shop -- in earlier Fergusons it mimicked 'maintenance' -- and sometimes, as in the work of a younger artists such as John Armstrong or Chris Dorosz, it reintroduces an artistic touch to painting practice in terms of a re-enchantment that relates to the repetitions of pattern in decorative art. More recent layer paintings including that of Chris Dorosz, Germaine Koh, and Angela Inglis, owe something to artists like Kennedy, Mary Scott, Paul Hess and the Jeff Spalding, but curiously, Spalding and Ferguson, to give two examples, in the 1980s began themselves to use loaded imagery in layer works.